The New England Spartan Sprint, Amesbury, Ma. Race Weekend dawned like any other, BlogLand. I was up early, pulling my pink spandex tank over my head (Spartan Chicks, represent! ), and heading down to the hotel breakfast to get some good fuel in me to get me through the trials ahead. As I noshed my cakey blueberry muffin, a rare carby indulgence saved just for race weekends, I had no idea that in less than 3 hours, I'd be down for the count and earning my first race DNF ever. As I drove past the race grounds that morning on my way to parking, I saw an awesome sight that got my adrenaline running for the day: a small army of black-clad Spartans violently and triumphantly cresting the top of the Amesbury hill and careening down the other side, smoke billowing around them, mud everywhere. I later found out that this was the Hurricane Heaters finishing up their almost 4-hour time, getting to know the course with their team mates, in a way that can only be experienced and not described. An Epic Sight to start the day, I let out an AROO! in my head and headed to find my own teammates. I was running that day with Spartan First-Timer, April, who was psyched and ready for the challenge. Having run several road races with April, and having her as a regular motivator at Sprint Night Hell, I knew she had phenomenal tiny-person speed (seriously, the tiny-people are super human, I think.). I was excited to see what kind of time we were going to make through this course, as Saturday Morning's goal was to push myself and do my best to run for time. As much as I thought I'd be guiding April through her first Spartan, I knew she'd be pushing me to run a little more or a little faster. I was stoked. Through the columns and smoke, Dropkick Murphy's resounding through air, we were off, running steadily up the hill - Spartan Race's idea of how to start a race (warm-up, what?!). In the theme of pushing ourselves, we kept running up the hill, until we hit a bottle-necked wall of walking people, that forced us to a walk at the steep part. My lungs were super grateful to the walkers that prevented us from running through, but I felt accomplished to know that I could've continued it right to the top. My legs were feeling great. Yes! The obstacles are a little out of order in my head at this point... shoulder-high mud pits, low walls, over-under-throughs, cargo nets, sandbag carries, muddy swamp walks... Spartan Race was in fine form, here in Amesbury. I was having a BLAST. I felt in shape, strong and in great company. April and I laughed, joked, sweated and ran, enjoying every moment. My highlight of the day came as we broke into a clearing in the woods to the Hercules Hoist (hoist a large cement weight up to the top of a large pulley and gently put it back down). The Men's weights were empty, but there was a long line for the women's (maybe half the weight?) pulleys. Standing in line, but eager to continue our race, I eyed the Men's Weights. Heavy lifting is my specialty and I was reasonably confident that I could do the Men's weight... egged on a little by April, I decided to go for it. With a big mental AROO! I grabbed that rope and squatted a powerful force of determination and strength against it. Hand over hand, using well-practiced body weight squats to help pull the rope, with a couple of grunts of exertion, I found myself slowly lowering it back down. Success! I suppose there is something to be said for being a burly Amazonian... I may not be able to delicately leap walls, but I'll be damned if I can't hoist that men's weight! My burpees of the day had found me at my usual enemies... the rope climb, the traverse wall (AH!!!! two moves from the end, when a foot slipped!) and the monkey bars. Damn you, monkey bars. I tried, BlogLand. I was prepared... but no matter how prepared you are, monkey bars are evil when your hands are freshly wet and muddied. There was just no holding these bars. My first valiant swing sent me sliding right to the ground and trudging over to do my penalty burpees. Grr. SOMEDAY, Monkey Bars!!! Finishing up my burpees at the rope climb (Let me just take this moment to say that April BEASTED up that rope climb and hit that bell!! Yes! ), April and I began our steady trot (still feeling strong!) towards the tall walls that we could see not too far ahead. My steady left, right, left, right rhythm was suddenly interrupted as my right foot found a hole hidden in the grass... I felt my leg buckle underneath me and heard a stomach-flipping, POP! as my ankle rolled and sent me sprawling. Sitting up, April remarked that she, too had heard the pop, and was I okay!? No stranger to ankle injuries in the not too distant past, I sat there for a moment, assessing the situation. Maybe I'd just tweaked it and it'd be okay in a second and I could stand up and continue on. No sooner did I finish this thought that the sickening wave of pain shot through my ankle and up my leg. 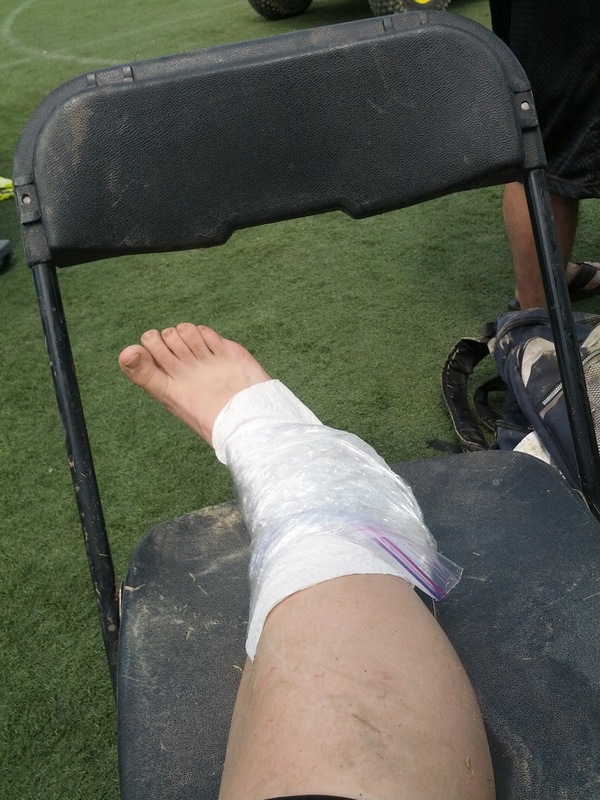 I bit my lip, holding back the tears and taking deep breaths to abate the throbbing in my ankle, mentally wrestling with the decision I knew I was going to have to make... there was no way I was going to be able to finish on this ankle. As I sat on the ground, clutching my ankle and trying to remain the picture of Spartan Strength, numerous Spartans checked in with me on their way by. Sending April to grab the (thankfully close by!) volunteer with a radio, I came to the horrible realization: I'd be letting my new-spartan down, unable to finish with her. However, no sooner did I finishing thinking that, Sparta answered. Jessica, the very first Spartan Chick I ever met in person, happened to trot by. She took it on as her personal mission to make sure April finished, just as she knew that I would've. If that isn't the Spartan community showing it's tight-knit nature, I don't know what is. Jessica and April had never met prior to briefly that morning, but Spartans help each other when in need regardless, and I felt relieved to know that I had left April in good hands. The burly EMT guy roared up on his 4-wheeler, making jokes about needing to amputate my leg and helped me on to the back of his ride. I accepted the inevitable as he navigated us back down the mountain and away from the course, trying to keep a neutral face and grit my teeth as the pain surged with each bump. He told me that hey, I should be proud that I made it through 70% of the course. I won't lie, BlogLand, my first thought was, "DAMN IT. I was almost to the end!!!" However, he made an excellent point. I had mentioned to him that this would'e been something like my 6 or 7th Spartan finish line... and he remarked that given the nature of the sport and the training that goes into it, it was amazing that I had gone this long without serious injury. I guess when you train hard to race hard, to just live out loud hard, eventually fate is going to slow you down every once in a while. Clearly, it was my turn. Getting helped off the four-wheeler and into the First-Aid tent, I was greeted by the most fabulous honorary Spartans out there. I'd like to take this moment to give a heartfelt AROO! to the staff of that first-aid tent, who made a really rough moment for me as painless as it could be. An experienced EMT handled my ankle delicately as he peeled off my mud-dripping sock and shoe. He delivered some excellent news - my ankle wasn't broken. I felt my body relax a half a degree at this news, as broken bones are a long process to come back from. I knew how to deal with a rolled ankle... that, at least, is a known evil. He then proceeded to employ a technique that I am totally stealing; he plastic-wrapped the ice pack to my ankle. With cling wrap. Yep. Saran-wrap. When I commented on this in awe of the ingenuity, he informed me that the key is to get the real stuff - not the cheap imitation. I just doesn't stick the same. With professional efficiency, I was escorted to a shady chair to elevate my ankle for a minimum of 15 minutes, while I was to eat this banana and drink this water. With the immediate situation resolved, I sat in the chair to let it all sink in. I bit my lip in frustration. I hurt. I knew I would be out of commission for several weeks while this healed. I hadn't finished. I didn't have my medal. I was currently alone and it would be quite a while before my friends realized I hadn't finished, and April would carry the news across the finish line with her. I was alone with my not-happy thoughts and throbbing ankle. This, BlogLand, is never a good place to be. Again, Sparta answered. Sitting down next to me was another spartan chick, knee immobilized in a temporary splint, waiting to go for x-rays at the local hospital. She struck up a conversation and we compared battle notes. As it turns out, this was her first Spartan and she was really disappointed about not finishing. Lucky for me, though, she was there and we were able to chat a bit and keep ourselves out of our frustrated, pained minds for a little while. Not only that, but her friends, after coming to check on her, even brought me an ice-cold beer in solidarity. 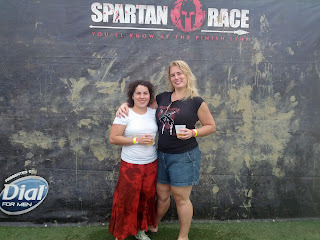 To my fellow injured Spartan lady, THANK YOU for our chat and my beer. I'll see you next year and would be happy to return the favor! It was not too long before April had finished and come to find me. Helping me hobble to the line for the hoses, she gave me the low down on the rest of the course. It sounded awesome, and I felt hot frustration burning in my stomach as I stood in the line of muddied Spartans, beaming with their accomplishments. It was right then that I heard my name over the noise of the crowd. Looking around, I didn't see any faces I recognized, but then Kelly from the Spartan Chicks came up and introduced herself. I had been on a mission to meet as many Spartan Chicks as possible this weekend, and was thrilled that Kelly had spotted me and said Hello. With muddy hugs and a quick explanation about my stupid ankle, we parted ways to get cleaned up. It was great, though, to be able to put another name to a face and see the triumphant muddy smiles of another Chick chasing down the finish line. T-Rex, Representing the Mud Mafia! I winced and whined alone in the car as I drove the 10 minutes over to meet up with my CG, and rock-solid support of the weekend, at the rock climbing competition where he had been showing some shoes. The weight of the day was starting to catch up with me. My ankle hurt like crazy (driving wasn't helping! ), and I hadn't crossed the finish line. I definitely wouldn't be able to run on Sunday with a whole bunch of people, as per planned. In fact, I probably wouldn't be running at all for weeks. Plural. I have big races coming up in not too long, and I felt my training time ticking away. I wanted to cry. Hard. However, I had just pulled into the parking lot full of people, and now was not the time. A deep breath and I pushed it back. It was time to try and look at this differently, not as a defeat. After many internal temper tantrums, each time I tried to step on my foot and pain ran through my leg, I started to find a slightly calmer center. I wasn't happy with this. I wasn't going to be happy with this situation. But it was the reality, at the moment. Time to Spartan Up. On the upside, I had not been seriously benched - my ankle was not broken, for instance. This is a familiar injury to me, one that I know how to take care of. I still had use of 95% of my body, if I was careful of my ankle. THAT means 95% of me can still be training, with a little thought and consideration to some different workouts. That also means that I will be focusing on my upper body again, a part of me that could certainly use the extra attention. All would not be lost, it would just be different. Now, I won't kid you, BlogLand... this was not an easy viewpoint to find, nor can I say it does not waiver slightly every time I am thwarted at doing something mundane (walking around my kitchen, for example!) by this ankle. To get to this point, I lost my mind in my head on and off the rest of Saturday and all of today, and I straight out turned the crazy, frustrated, pained, angry, disappointed waterworks on the poor, unsuspecting CG. Yep, a big 'ol Ugly Cry, BlogLand. A nose-running, sobbing, big teared, chest heaving, air gulping cry. Here's the lesson there; you can hold it together. You can be strong, you can present the happy face to the world, but you can't help feeling what you feel. Eventually, to move forward, you have to get it (let it) out. It was a cathartic sob-fest this evening, BlogLand. With some very helpful positive words from the CG to help bring around my point of view, I was able to pour out the negativity and work on building a plan - not wallowing in my temporary defeat. It is not the end of the world, or the end of my Spartan journey. Not even the end of my Race Season. Just a temporary detour, involving a lot of ice, tiger balm and upper body WODs. Things have been worse. As someone commented on my FaceBook status earlier today - at least I incurred this while doing something AWESOME, not just walking across a parking lot. Why's my ankle swollen and taped up? 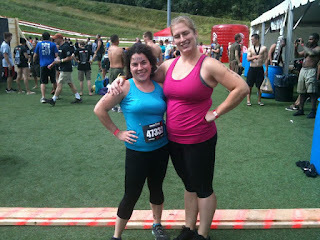 Because I dared cross the Starting Line of my 7th Spartan Race. Because I got up off my couch and was pushing the limits of my life. Because I was chasing my potential to see what I could do. Because I was too busy, covered in mud, smiling and laughing with a friend, while running through a field, after conquering a dozen obstacles, to climb up a 10-12 foot wall, to notice a tiny hole in the grass. There are worse things, BlogLand. "If you've had enough of all your tryin', just give up the state of mind you're in: If you want to be somebody else, if you're tired of fighting battles with yourself, if you want to be somebody else.... CHANGE YOUR MIND." I was there that day!!! And the EMT dude is right. You've done more than 3 and haven't gotten injured? Kudos. LOL. My bro dislocated his shoulder in one that he did. Hang in there! Amazing girl!!! Loved reading this one!! So sorry about your ankle- that is a bummer. But like you finally realized it's not a race ending injury & knowing you through your posts- I see a lot of good training still in your future. I hope your feeling better today & hang in there!